"Game of the Flag Officers"
As a Timawan on the inside put it: "Game of the Flag Officers"
MANILA, Philippines (UPDATED) – Vice Admiral Ronald Mercado on Tuesday, December 19, stepped down as chief of the Philippine Navy 3 months before his term was supposed to expire in March 2018. Three sources in the military confirmed this information. 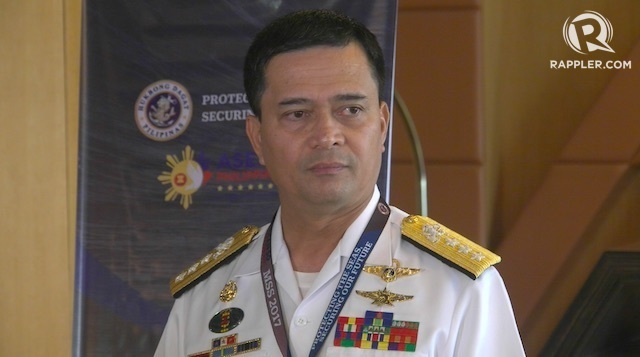 Mercado has been assigned to the office of the AFP chief, while Rear Admiral Robert Empedrad was designated as acting Navy chief. Re: "Game of the Flag Officers"
The prevailing tide in the FB extensions discussions point to Mercado as the victim. However, there is also another narrative that bears attention. Translating the flag-vs-flag aspect of the story highlighted below. What is clear is: Nobody in this story is coming up roses. Note that there are Timawans on BOTH sides of this discussion. "Empedrad, who was Patrol Force commander at the time, accused Mercado -- who was under investigation for another issue -- of favoring a French company for the the CMS, according to the official"
“Bulaga pa kami lahat dito sa area. Bago na daw ang FOIC,” sabi ng opisyal sa Bandera, Lunes ng gabi. Una pang nalaman ng mga opisyal ng Army na nakatalaga sa Camp Aguinaldo ang balita, aniya pa.
Inaprubahan ni Pangulong Rodrigo Duterte ang pag-relieve kay Mercado matapos itong iutos ni Defense Secretary Delfin Lorenzana, sabi naman ng isa pang opisyal sa mga reporter, Martes. Nag-ugat ang relief sa pagtatalo kamakailan lang nina Mercado at Empedrad, tungkol sa combat management system (CMS) para sa biniling P16-bilyon frigate ng Navy, anang opisyal, na tumangging magpalathala ng pangalan. Inakusahan ni Empedrad, na noo’y commander ng patrol force, si Mercado — na noon nama’y pinaimbestigahan ang una para sa ibang isyu — ng pagpabor sa isang French company para sa CMS, ayon sa opisyal. Nang matalaga si Empedrad sa kanyang puwesto sa Camp Aguinaldo, nakarating umano kay Lorenzana ang isyu sa pamamagitan ng isang “classmate” ng una na isang assistant secretary sa DND, sabi pa ng source. MANILA, Philippines – Citing its being "highly unusual and unceremonious on so many counts," Magdalo Representative Gary Alejano said he would file a resolution calling for a probe into the sacking of Philippine Navy Vice Admiral Ronald Joseph Mercado. Alejano said he would ask the House committee on national defense and security to look into the matter once Congress resumes session in January 2018. Sources said Mercado’s relief stemmed from the procurement of a weapons system under the Philippine Navy’s Frigate Program, worth P18 billion. One source explained that it all started when the technical inspection and acceptance committee and project management team staff of the Philippine government went to India to assess whether an Indian supplier was financially capable. The Indian supplier failed the evaluation system, which gave the deal to the second lowest bidder, Hyundai Heavy Industries of South Korea. Mercado apparently was “not contented” with the content of the contract signed by Defense Secretary Delfin Lorenzana. “That was a breach of contract. He (Mercado) was not contented. He was favoring a company, citing that it was the only company that had the specifications of the weapons system he wanted,” the source said. 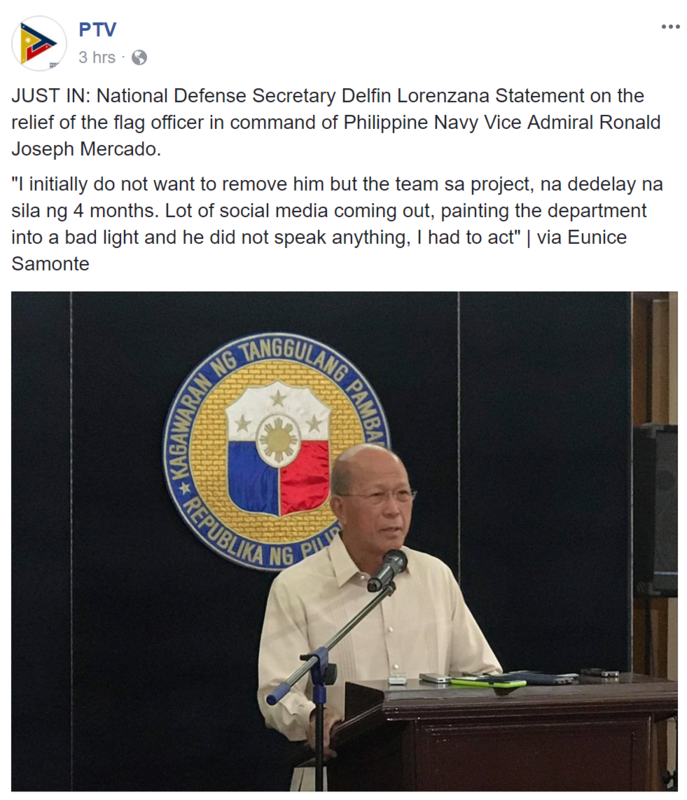 Mercado “made noise,” and “even called on former flag officers in command of the Navy,” the source said. The meeting with the former Navy chiefs “offended” Lorenzana, according to the source. Another official said Mercado lost the trust and confidence of Lorenzana amid “conflict” between the Philippine Navy and the Department of National Defense. 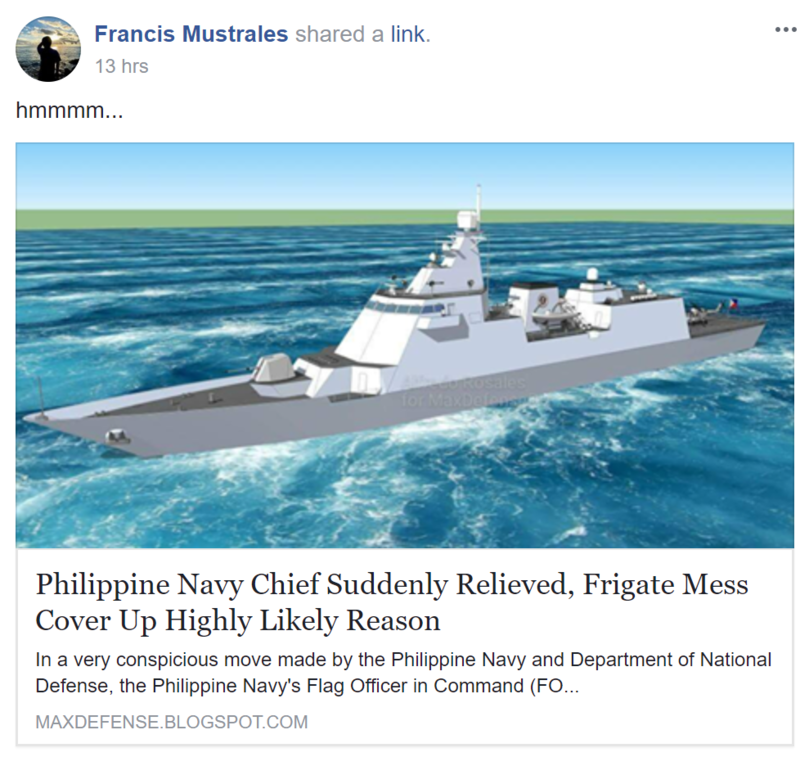 The source also said Empedrad had a misunderstanding with Mercado when the former was commander of the Navy Patrol Force and project manager of the frigate program. “Empedrad is claiming that Mercado favored a French company [for the combat management system], because [Mercado] just came from France at the time. That’s how their rift started,” he added. What was offered should be the one that must be put up in the PN Frigates? Kung di naman pala kaya bakit pa nag offer ng ganun. “I have lost my trust and confidence in his integrity and leadership. 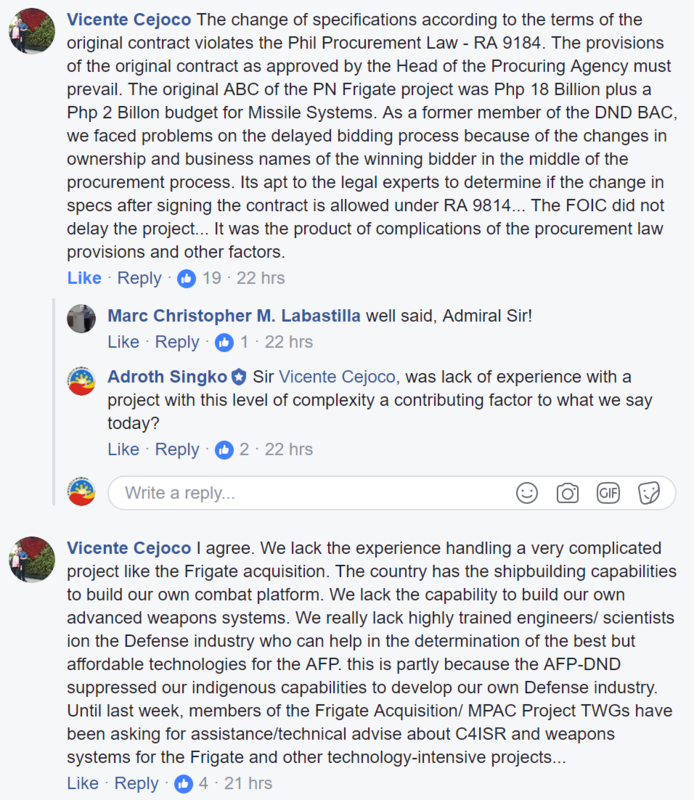 I questioned his intention behind his fixation with this specific company for the combat management system (CMS) for the frigate acquisition,” he told reporters in a press briefing at Camp Aguinaldo. “Sa program natin, it says na ang mamimili ng CMS is the builder which is Hyundai. Ngayon, Mercado wants to bring in another company na hindi kasama sa kontrata..Nagbabalikan ang mga directives…I issued two directives which he disregarded. To me that is tantamount to insubordination,” he said. The Philippine government signed a P16-billion contract with Hyundai Heavy Industries in 2016. Lorenzana claimed that Mercado insisted on his preferred CMS and even went around “forum shopping” to meet former Navy chiefs. He also talked of rescinding the contract. “In social media it’s being painted out that the department is the one hindering the project and he is not doing to correct the misperception,” the defense chief said. So what exist is a contract between the Philippine government (GRP) and Hyundai. If it was agreed to in the contract that Hyundai will choose the CMS provider, then this provision cannot be change without a contract modification. In scanning RA 9184, I could not find areas dealing with novation, preservation of the GRP’s right to unilaterally modify and / or terminate contracts or any methodology by which these actions can be carried out. As I have no knowledge of how the GRP write their contracts, I can only refer to the Federal Acquisition Regulations (FAR). In the case of the change of ownership and name of the winning bidder, FAR Subpart 42.12 -- Novation and Change-of-Name Agreements, under 42.1203 -- Processing Agreements, a) If a contractor wishes the Government to recognize a successor in interest to its contracts or a name change, the contractor must submit a written request to the responsible contracting officer. On the other point, if the GRP did not preserve its right to oversee or have a say in the choice of Hyundai’s CMS subcontractor, then it is not privy to the agreement between the prime and the sub. In other words, if allowed, the GRP is only an observer as long as the specs are being met. I think I have a feeling as to what happened to the contract. It's possible that HHI contracted with the predecessor of the current Hanwha(one-time Hanwha Thales), which was then Samsung Thales, to provide their CMS for the Philippine Frigate Aquisition Project(which was then still the Thales product). Now, owing to delays for multiple reasons, events slowly caught up to our acquisition teams, the PN, and the DND... change in ownership happened and direct working partnerships were apparently dissolved... forcing the DND to accept whatever CMS provided by HHI's subcontractor. Now, IF we have no specific language in our laws with regards to such protections in case of changes in ownership and other similar events... We would technically be at the mercy of the winning contractor/supplier. it maybe time to update the RA. Just looked at the PMC MITSS Project thread and from what I can tell, from Emmen Aerospace to Bosh Technologies to MAG Aerospace. This soap opera is surreal. Unlikely. The change from Samsung Thales to Hanwha happened only in 2015 with the deal completing in July 2016 with the exercise of the options. The contract for the FAP was only awarded in October 2016. HHI wouldn't have signed any sub-contracts with third parties without a main contract from the client. They might have signed MoUs or teaming agreements but those ain't worth anything. Even if the main contract was signed, only the CDR phase would determine/freeze the design, allowing for these sub-contracts to proceed. Two, the CMS is closely tied to the weapon system suite. Given the original intention was to have the likes of the NS106, Bluewatcher etc, it seems more likely that the intention in HHI's proposal was to contract Thales directly, appointing them as the Combat System Integrator or CSI. This change in CMS shouldn't be viewed in isolation; it is part of the purported series of changes to the other sensors as well. Companies like Samsung Thales/Hanwha are not mere distributors/reps of Thales. Like Yaltes (Turkey/GENESIS) and PT Len (Indonesia/SEWACO) were set up to receive 1) provide local technical support to Thales, 2) receive tech transfer/develop their national CMS. If the plan was to go to them, it would have been their national CMS.